Luis Rengifo does not have any MLB stats for the season. Luis Jose Rengifo (wren-HE-foe)... Originally signed by Mariners scouts Tim Kissner, Emilio Sarrasquel and Illich Salazar. award for August...Following the season, recognized by MiLB.com as an Angels Organizational All-Star... According to Baseball America, enters the season as the Angels #6 prospect as well as the Best Hitter for Average and Best Strike-Zone Discipline...Ranked by MLB.com as the franchise's #10 prospect. 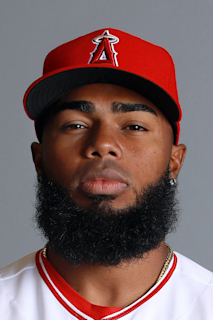 March 16, 2019 Los Angeles Angels optioned 2B Luis Rengifo to Salt Lake Bees. November 20, 2018 Los Angeles Angels selected the contract of 2B Luis Rengifo from Salt Lake Bees. July 12, 2018 2B Luis Rengifo assigned to Salt Lake Bees from Mobile BayBears. May 22, 2018 SS Luis Rengifo assigned to Mobile BayBears from Inland Empire 66ers. April 2, 2018 SS Luis Rengifo assigned to Inland Empire 66ers. March 20, 2018 Tampa Bay Rays traded 2B Luis Rengifo to Los Angeles Angels. March 8, 2018 2B Luis Rengifo assigned to Tampa Bay Rays. August 7, 2017 SS Luis Rengifo assigned to Bowling Green Hot Rods. August 6, 2017 Tampa Bay Rays traded C Mike Marjama and RHP Ryan Garton to Seattle Mariners for Player To Be Named Later, LHP Anthony Misiewicz and 2B Luis Rengifo. April 4, 2017 2B Luis Rengifo assigned to Clinton LumberKings. February 28, 2017 2B Luis Rengifo assigned to Seattle Mariners. October 6, 2016 2B Luis Rengifo assigned to Navegantes del Magallanes. June 2, 2016 2B Luis Rengifo assigned to AZL Mariners from DSL Mariners1. September 18, 2015 2B Luis Rengifo assigned to Navegantes del Magallanes. March 6, 2014 Seattle Mariners signed free agent 2B Luis Rengifo to a minor league contract. March 6, 2014 Luis Rengifo assigned to VSL Mariners.